Alexis Coe once worked as a research curator at the New York Public Library, and she shows off her skills to great effect in her first published volume of nonfiction. 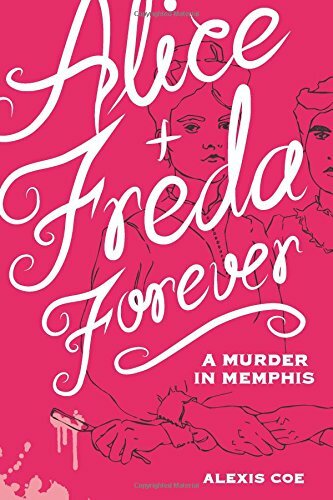 Alice + Freda Forever details the murder of Freda Ward by her former lover and fiancee Alice Mitchell, but Coe includes much more than just the narrative. Woven throughout the text are letters between the two teenage girls, excerpts from news articles about the case, and best of all, lovely illustrations by Sally Klann. The book reads like a fabulous mashup of history, sociology, and art—plus it's a damn compelling story. Freda's murder made a big splash in the national news, but not because of her gruesome death. People in 1892 were fascinated and puzzled by the fact that two women had planned to marry. No one knew how to talk about homosexuality; the papers and the courts only talked around the issue. Alice's plan was to pass as a man and support herself and Freda, but when their romantic letters were discovered by Freda's family, the two were forbidden to see each other again. Freda, an incurable flirt, accepted the loss of their relationship with equanimity. Alice, on the other hand, was incensed that Freda could abandon their love so easily, and with her father's razor in her pocket, set out to confront her former lover once and for all. Coe does an excellent job of illustrating what it must have felt like for the girls, especially Alice, to be who they were in the time that they lived. These are the kinds of histories I find myself most interested in: stories of individuals who were “other” in some way, and what their lives and experiences were like. We need more books like this one on our shelves and in our libraries! It shouldn't be such a novelty to encounter a work of historical nonfiction that centers around someone other than dead white male politicians.